Please contact all the below listed distributors/manufacturers for Diallyldimethylammonium chloride and ask for prices, package standards and transport possibilities. Our registered distributors will help you to get all necessary information and product specifications. Tatva Chintan is a well established ISO 9001:2008 certifide manufacturer of Phase Transfer Catalyst, Quaternary Hydroxides of Electronic grade, Quaternary Ammonium /Phosphonium / Pyridinium compounds and Specialty Chemicals located in India since 1996. Tatva Chintan Pharma Chem Pvt. Ltd. is supplier for Diallyldimethylammonium chloride. We are seller of Tetrabutylammonium hydrogen sulfate. Our plant facility has been audited by NOVARTIS for HSE and by GSK for QMS. We are approved supplier for both the above MNCs. Your partner in China for chemicals business. Expertize in supplies and sources of fine, specialty, pharmaceutical chemicals and intermediates. WE offer high quality products and JIT services with instant market intelligence in China, custom synthesis in our 3 production sites, famous principals as Brenntag, Univar,S inopec, Grace, Petrobras, DKSH, Formitex, Evonik, Merck, TCI, Sanofi, Chemo with creditable reputation and business cooperation. Simagchem Corporation is a seller of p-Xylylene dibromide. Simagchem Corporation is supplier for Diallyldimethylammonium chloride. Haihang Industry Co., Ltd.,is a leading producer and supplier of chemicals industry in china. By integrating people, technology and potential, we endeavor to make contribution to the betterment of human society. We develop, produce and distribute high quality pharmaceutical chemicals, special chemicals and other fine chemicals. We are supplier of N-(Benzyloxycarbonyloxy)succinimide. Haihang Industry Co., Ltd. is supplier for Diallyldimethylammonium chloride. 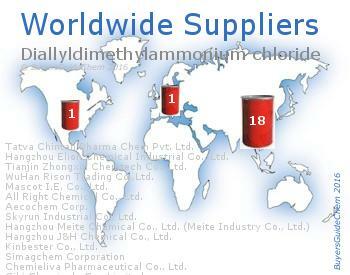 Hangzhou Yierdechem Co.Ltd is supplier for Diallyldimethylammonium chloride. Additionally 4-Bromo-1-naphthoic acid is supplied by us. Your partner in China for chemicals business. p-Xylylene dibromide will be also provided by us. Expertize in supplies and sources of fine, specialty, pharmaceutical chemicals and intermediates. WE offer high quality products and JIT services with instant market intelligence in China, custom synthesis in our 3 production sites, famous principals as Brenntag, Univar,S inopec, Grace, Petrobras, DKSH, Formitex, Evonik, Merck, TCI, Sanofi, Chemo with creditable reputation and business cooperation. We supply our chemical product (1S,4S)-2-Methyl-2,5-diazabicyclo[2.2.1]heptane dihydrobromide. Ring Specialty Chemicals is a chemical trading and sourcing company. Benzaldehyde oxime will be also provided by us. Our main focus lies in sourcing and supply specialty chemicals, pharmaceuticals, and intermediates from China to customers worldwide. Backed up by an excellent network of proven and reliable Chinese manufacturers, we are proud of providing efficient and cost-effective sourcing services to our customers. With our labs in China, we also provide high quality custom synthesis service. INNOCHEM is an ISO 9001 certified company specialized in the worldwide marketing of chemical specialties for a wide range of industries. We supply our chemical product 2,6-Lutidine. From our offices in Belgium, France, Germany, the Netherlands and USA and through our network of contacts in the Far East we are serving our customers with high quality sourcing at competitive prices.